The Pride of the High Seas, Reduced. I like scrap yards; I’m fascinated by what happens to the things that developed societies don’t want anymore; and I’m even more fascinated by the ingenuity that developing societies do with those throwaways. Scrap yards are not, by their very nature, sentimental places, and I really can’t say that I’ve ever felt emotional about the automobiles, appliances, and other recognizable items that I’ve witnessed being cut, crushed and shredded, worldwide. But there’s one exception: ships. I don’t know why, but there’s something undeniably poignant about witnessing a large sea-faring vessel reduced to steel, and then to nothing. Below, a photo that I took on Saturday at a Chinese ship-breaking facility. 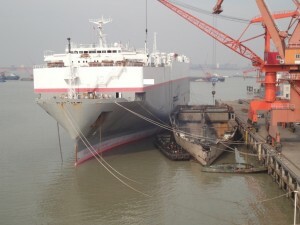 To the left, a just arrived vessel undergoing the first stages of its demolition. And to the lower right, its eventual fate (roughly two months from now) as embodied in a (once) similarly-sized ship. Click to enlarge. I’m told that vessels which arrive at this particular ship-breaking yard are greeted by a shower of fireworks ignited to scare off any ghosts that they might be carrying. In one notable case, the shower of fireworks was accompanied by bagpipes played by the ship’s captain – in his kilt – as the ship docked. I’m also told that – due to a superstition that nobody was willing to explain – women were only recently allowed to board the ships. If somebody knows why – perhaps a sea-faring reader? – I’d be much appreciative if you commented or emailed via the contact form. 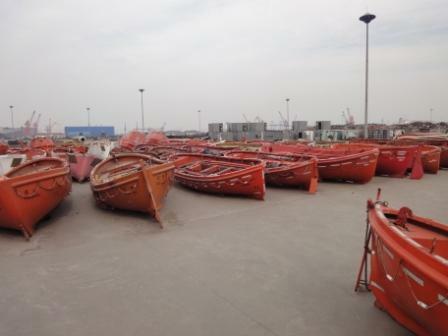 Around the corner from those disintegrating ships, a yard full of their leftover lifeboats. They’re sold, as is, to other ship owners. Second hand ‘sold as seen’ life boats aren’t at all reassuring! 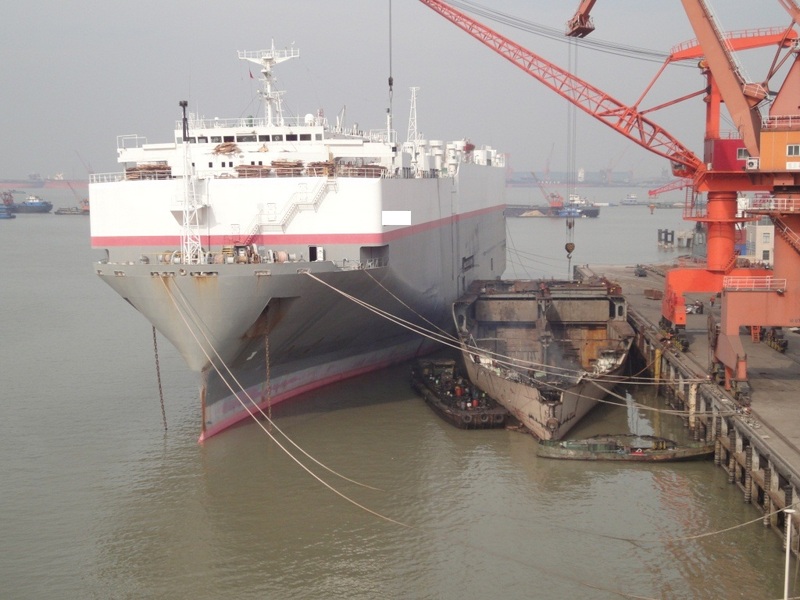 Interesting, I didn’t know that there are ship breakers in China. There’s an 60 minute article about ship breakers in Bangladesh. Where is this located in China? Is it run by a local government or private company? I seem to remember reading that sailors across multiple cultures are superstitious about having women aboard their sea-faring vessels. They bring bad luck apparently. Interesting to see the rituals and traditions that still exist on ships and shipyards.